The second installment in our Home4Ever Puppy Project series to reduce the number of abandoned and surrendered dogs through education. There is no doubt: puppies are adorable. Some say irresistible. But that cute little bundle of fur comes with a lifetime list of expensive needs. Before you buy, or even adopt, you can avoid heartbreak by hitting the pause button to consider the true cost of dog parenthood. And remember…the bigger the dog, the higher the cost. Destroyed furniture, rugs, sprinkler heads, plants, and lawns ?? 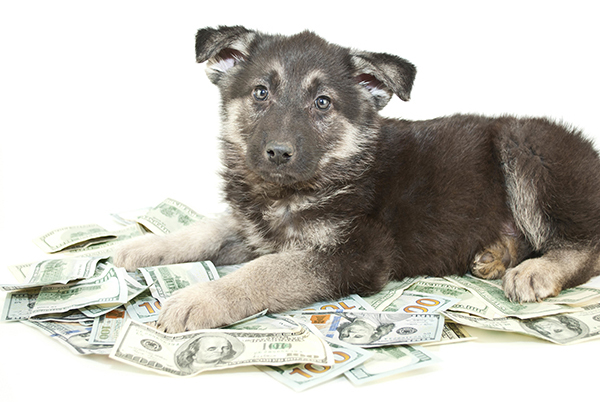 That’s a budget of $5,000 per year—after the initial cost of bringing home puppy! Sure, you can definitely save by doing the training and grooming yourself and never going anywhere. You can even decide not to budget for pet insurance or pet emergencies, but more often than not those emergencies are what prompt people to surrender their dogs. Puppies (or dogs) should never be an impulse decision. For their sake and yours, consider the true cost of pet ownership before bringing a fur family member home. More than you can responsibly take on but still love puppies? Here’s a thought: foster instead! Get all the benefits of puppy love, help them to get the right start in life, and then—just as the get big enough to start chewing up your house—help them find a forever home with the financial resources to ensure a lifetime of care. So rewarding!